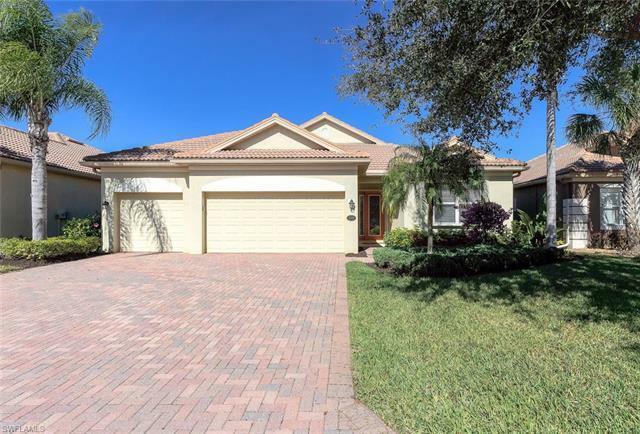 Pride of Ownership shows here....This rare Royal Palm model awaits your arrival with approx. 2300 square feet of living area and a highly desired great room layout. Brand new exterior paint job! This home can be purchased fully furnished if preferred. Offering 4 bedrooms, 2 baths, 3 car garage with additional overhead storage and in pristine condition!!! Some of the many features include nicely tiled flooring throughout except in the bedrooms, a warm neutral colors scheme, etched glass front door, upgraded accordion hurricane protection throughout, large island-style kitchen with a custom glass backsplash and stainless steal appliances, 42" wooden cabinetry, granite counters and more! In addition, this well designed home includes many architectural accents such as archways, niches and tray ceilings. This home overlooks natural and private preserve views and is a great setting for entertaining. Priced to sell and you should come view this home before it sells. Bella Terra has a Resort-style Clubhouse, a 24 hour fitness center, activities for all ages, resort pool and spa, secured shaded children's play area, tennis and pickle ball courts and much more....and LOW HOA FEES! Selling Office: Realty World J. Pavich R.e.